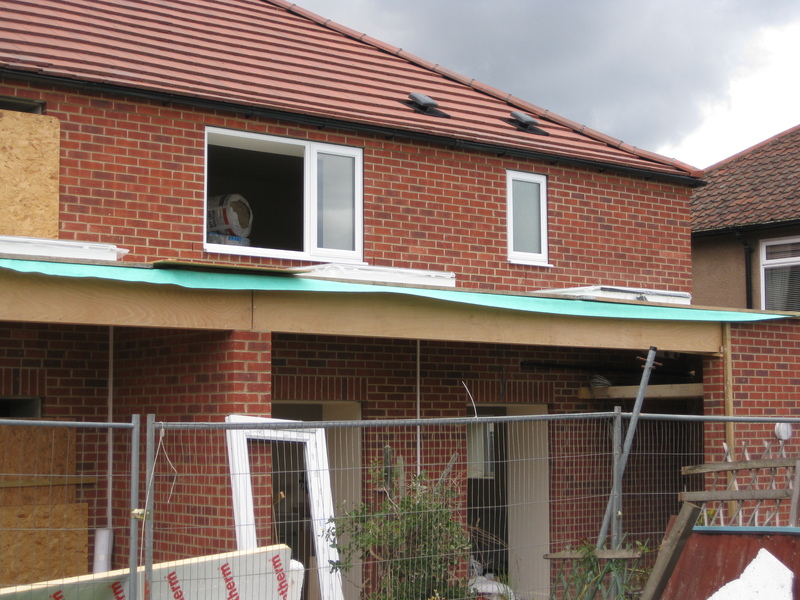 Now the external walls are complete, the sunspaces and porches can be added to the houses. The sunspaces to the rear are one and a half storeys high, with flat roofs containing two Velux roof lights, one opening and one fixed. The sunspaces are thermally separated from the main house, i.e. 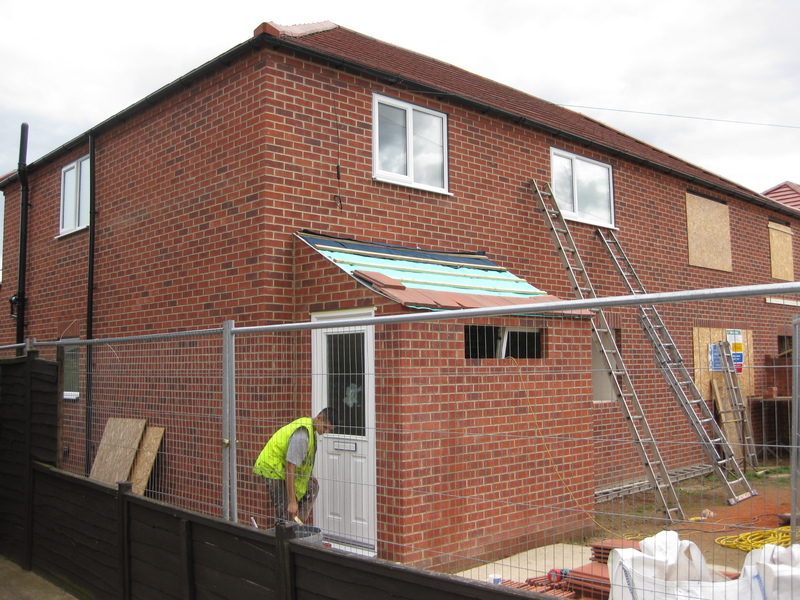 there are external quality triple glazed windows and doors between the house (kitchen/diner) and the sunspace. The sunspace will harvest passive solar energy, and when the sunspace is warmer than the house, and the tenant wants to heat the house up, the windows and doors can be opened to the house and this heat will then transfer in and get absorbed into the mass of the floor and walls; it will then get given up by the mass when the air temperature cools. We are also planning to have this harvesting automated by a modification to the mechanical ventilation and heat recovery unit, such that it will take its air supply from the sunspace instead of outside, when the sunspace is warmer than the house, and the air temperature inside the house is below a pre-defined minimum. The sunspaces also include a downstairs bathroom, with a shower, hand basin and toilet, which adds lifetime homes benefit to the houses. The porches help to separate the internal environment from the outside; they effectively act as an airlock to the house. In winter only one door should be open at any one time, this will help reduce heat loss from the house, and thereby help to keep them warm. 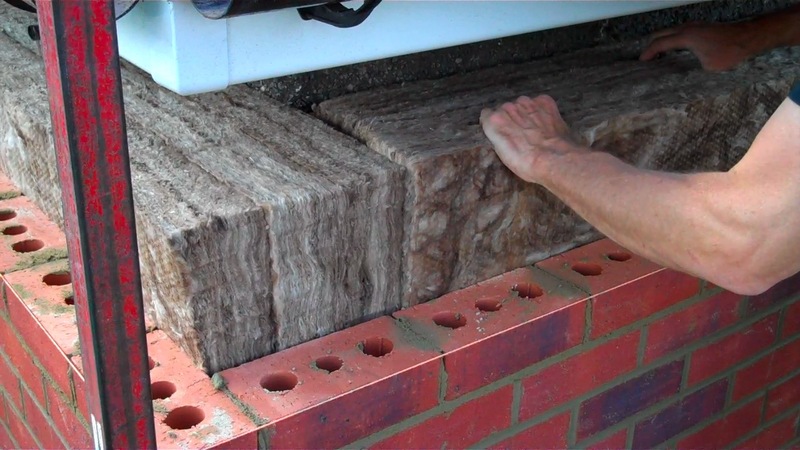 The new external brick skin of the walls is now built up, and the cavity created between that and the original solid concrete walls has been fully-filled with insulation. The insulation is between 250-300mm thick; the variance is due to the fact that the original walls had shifted slightly over time, so in some places the cavity was slightly wider than others, and we took every opportunity to get in as much insulation as possible! 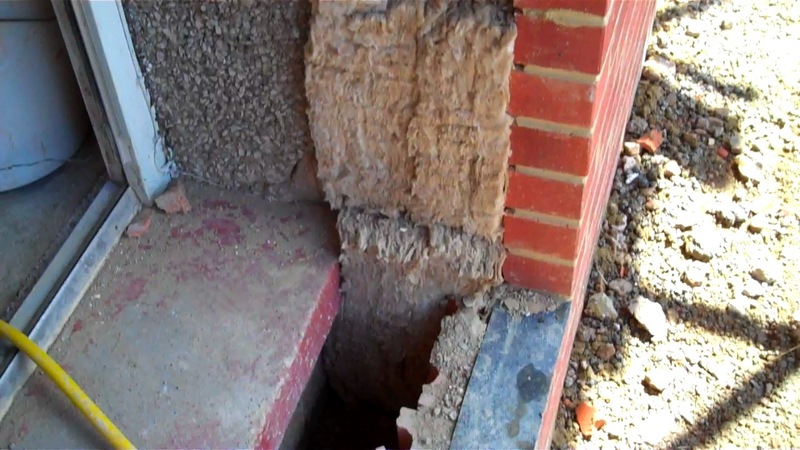 You can also see in the photo above that the cavity extends down below ground level, to the bottom of the original wall foundations, and insulation was packed down here as well to minimise thermal bridging from the internal floor to outside. 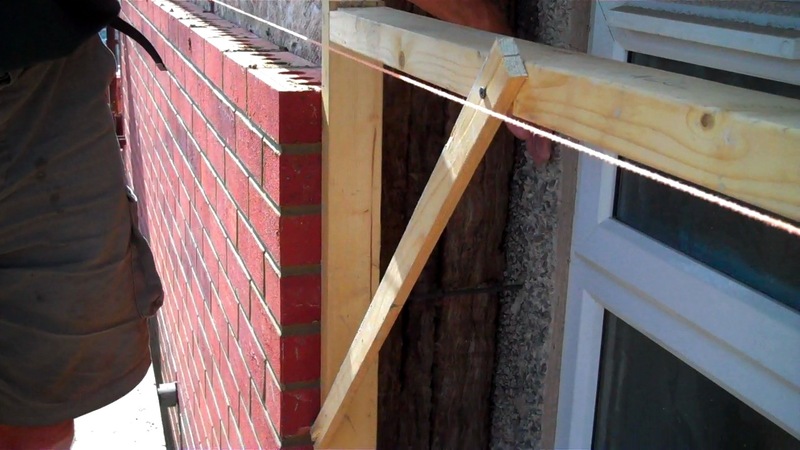 The photo above shows the insulation being packed into the cavity just below the existing eaves. The insulation is then continued up over the top of the original wall, between the rafters and into the roof space to again minimse thermal bridging at the top of the original walls. This is the weak point of the overall insulated envelope however, as the void over the orignal wall between the rafters only allowed for around 150mm of insulation. The roof was then extended by two rows of tiles to meet the corbelled external skin. The photo above shows the newly created cavity at one of the windows, and if you click on the photo to expand it you can just see the wall tie spanning the cavity four brick courses down. These ties were secured into the original wall by drilling a hole and inserting the tie with a mortar fill and they then span the cavity and are secured in the mortar layer of the external skin. The ties used are Teplo Ties from Ancon, which can be cut to length; traditional ties do not come in sufficient length for this sized cavity.